In October we start to prepare to harvest the rewards of our labours of the past months. All topdressings, fungicide sprays and herbicide applications are a thing of the past. 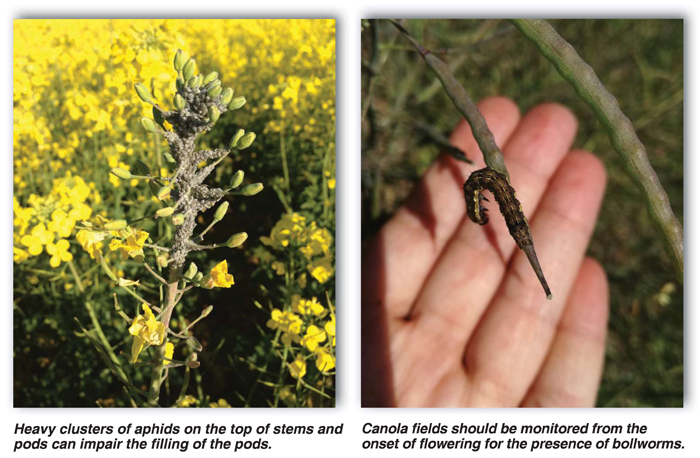 Canola that is in the early pod filling could still be prone to late insect infestations and regular weekly scouting should still be conducted. This is more likely in canola that has branched excessively due to a less dense stand and the pods on the outer branches are slower to develop. Insects that can cause economic damage at this stage include aphids, diamond back moth and bollworms. Only infestations that exceed the recommended spray threshold should be sprayed. Aphids generally become a problem during hot, dry weather conditions. Heavy clusters of aphids on the top of stems and pods can impair the filling of the pods. Only consider a spray application if a high number of plants are infested. Mature canola can tolerate a higher infestation of aphids than in the earlier growth stages. Cold weather slows the increase in aphid populations and rain can even reduce the population. Beneficial insects like wasps, hover flies and ladybirds are predators or parasites of aphids and can reduce populations. It is therefore important to monitor the situation regularly to determine whether a spray application would be economically justifiable. Be on the lookout for small white moths that fly between plants when disturbed. Inspect plants for signs of light green larva that are often suspended from a silk thread in the plants when disturbed. Small larva eat holes in the leaves which is also a sign of possible infestation. When they grow larger they will eat holes in pods which can also result in secondary damage by diseases. The life cycle of DBM from eggs to adult moths in warm temperatures (28°C) can be as short as 14 days, so populations can increase very rapidly. Spraying for DBM should only be considered when more than 20 larva of 3 mm to 4 mm in length per ten plants are counted in the middle to late flowering stage. This figure increases to 50 larva per ten plants at the pod filling stage. Canola fields should be monitored from the onset of flowering for the presence of bollworms. Night flying moths lay white eggs singly on the upper surface of leaves. The bollworm moth has reddish brown front wings and creamy white back wings. An adult moth can lay as many as 1 000 eggs during her five to eight-day lifespan. The eggs hatch after a week, producing small larva that feed on foliage. These larva moult six times within 14 to 18 days and an adult larva can reach 3 cm in length. Because of the large number of eggs laid, populations can increase rapidly, and heavy bollworm infestations can cause serious damage to the crop. Conditions favouring outbreaks of bollworms include drought conditions, heavy aphid infestations as the moths feed on the honeydew produced by aphids or the absence of alternate feed sources for the larva. Bollworms in the early larval stages (less than 1 cm) are more easily controlled than adult larva. Spraying should only commence when five to ten larva per m2 are counted. Many farmers tend their canola for the whole growing season, only to lose net profit at the end of the season. Many researchers believe that unnecessary losses, which cost the farmer nothing if corrected, occur at swathing and in the harvesting process. Estimates of yield losses due to incorrect timing or loss of grain in combining can easily vary from a few kilograms to 500 kg/ha. At current prices, this represents R500 net profit per every 100 kg loss. The availability of equipment is usually a deciding factor in whether to swath or to harvest directly. In areas that experience strong wind when canola starts ripening swathing should be preferred as extensive losses can occur to standing canola. Swathing has other advantages over direct harvesting, although many farmers in both Australia and Canada have returned to direct harvesting. When canola ripens unevenly swathing assists as seeds tend to ripen more uniformly when swathed. It can also assist a farmer to combine the harvest 8 to 10 days earlier. The ideal time for swathing is when seed discolouration is between 40% and 70% with a moisture content of 30% to 40%. A farmer should rather err on the later side, especially in hotter, dryer areas because higher temperatures cause windrows to dry faster. Canola swathed too early can cause green kernels and smaller seeds with lower oil content. To determine seed discolouration, samples of 100 pods which are representative of the entire field should be collected. As seed ripening starts at the bottom of the plant, pods should be picked from the bottom, middle and top of the plant on the main stem. Open the pods and observe the degree of seed discolouration. Count the number of seeds that have discoloured to yellow, brown or black. In the Canola Production Manual clear illustrations for determining seed colour change are pictured. 27°C to 30°C: 7% to 8%. If canola is swathed four or five days too early, yield losses of up to 10% may be suffered. The ideal window for swathing lasts only three to four days. This period occurs approximately 21 to 25 days after flowering, depending on the climate. Yield losses if swathing takes place too late can be reduced by swathing at night or when humidity is at its highest. The cutting height should be above the branching of the plants, so that the standing stubble forms a fork in which the windrow can lie. This ensures better wind movement under the windrow and the canola dries faster. Depending on climatic conditions after windrowing such as temperature, wind and humidity, canola can be combined approximately 7 to 14 days after swathing. Seasonal conditions are the largest factor influencing when canola can be direct harvested. Generally, canola is ready for direct harvesting about 16 to 20 days after the optimum windrowing time, but a dry season will speed up the time before harvest. The key to correct timing for direct harvesting is seed moisture percentage. The ideal level is 7,5% to 8%, which means pods are less likely to shatter and there will be a smoother flow of stalks into the header. Reaping at 7,5% moisture means canola can be harvested without dew as plants will still be a bit green. If farmers wait until canola stalks start to turn white in colour, as they would for harvesting windrowed canola, seed losses will be higher. If seed moisture drops below 8%, then keep harvesting and do not stop. Pod maturity may develop quickly in hot weather, so timing is critical. Harvest speed is more critical when direct harvesting canola compared to other crops. Excessive speed, especially when the crop is dry, can cause significant shattering at the knife and divider. Harvest speed may need to be gradually reduced as the day approaches midday. Harvest when the relative humidity is above 70% and stop harvest when it falls lower. Canola may be delivered with a moisture content of up to 14%, provided that drying facilities are available. When canola has ripened unevenly, late weeds have germinated and can cause problems at harvest or when the crop has lodged, chemical ripening can be considered. Only use a product that is registered for chemical ripening as other product’s residues could disqualify the delivery of the crop. Proper wetting of the entire plant is important as the contact chemical does not translocate in the plant. The stage for applying a chemical ripener is very important as too early a spray will result in pods not developing further. For chemical ripening, seeds must be at between 70% and 80% discolouration which is later than for the swathing stage. The canola will be ready for harvesting between four to seven days after spraying, depending on the size and density of the crop. Be careful to only spray an area that can be harvested within one or two days in order to avoid losses due to shattering. Once a field has been harvested, a number of actions can assist farmers to plan for the future. Look at cut stalks to determine the level of infection of black leg and sclerotinia. Should indications be that a high level of sclerotinia was present, try to not plant canola in fields in close proximity to the infected field the following season. Also rate the efficacy of your weed control programme. Note which weeds are present, determine whether the chemicals used were the right choice for your dominant weed spectrum and plan with your advisor should changes have to be made for the future. Finally, consider which fields are to be planted to canola next year and consider the harvest process of the current crop. Canola does not germinate well under a heavy stubble load, so consideration should be given to either reducing the amount of stubble left, e.g. by baling the straw, or cutting and spreading the straw evenly to avoid clumping of residues.